Rivets and fasteners traditionally required by the manufacturing process can interrupt a beautiful product design. 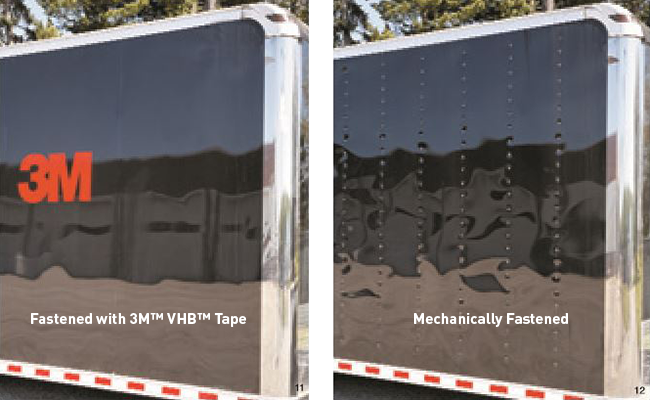 3M™ VHB™ Tapes were created to integrate seamlessly with your product to showcase your work, not what holds it together. VHB delivers the dependable quality that 3M is known for with the simplicity of a tape fastener. It can be used in a variety of industrial applications for both interior and exterior bonding. 3M™ VHB™ Tapes consist of an acrylic foam core that is “viscoelastic.” The unique characteristics of these products allow them to absorb energy- and stress-relaxing forces that cause normal tape products to fail in critical applications. What will you do with 3M™ VHB™ Tapes? VHB offers applications for the transportation industry, metal fabrication, construction, electronics, signage and more. As a 3M certified partner, The BoxMaker offers custom 3M™ VHB™ Tape converting, including slitting and die-cutting for short-run and quick-turn projects. *Samples are only available for residents in Washington, Oregon, or Idaho. Please allow up to 10 weeks or more for delivery & processing. Limited supply of samples available. While supplies last.